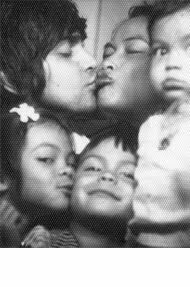 When I was younger my best friend and I used to babysit three wild children while their parents, our mentors & friends of the family, went out for “date night”. This family had a weekly tradition on Fridays called “Pizza Movie Night”. It was simple just like it sounds, the Mom would start with a whole wheat crust that was lightly sweetened with honey and simply topped with a squeeze bottle of pizza sauce and shredded cheddar cheese. The pizza was simple but there was something so cozy about cuddling up on the couch with three little ones and a movie. Knowing it was a “family tradition” you felt like you were part of something, creating memories that would be passed down through the years. I decided, after several Pizza Movie Nights that when I had my own family I’d start the Friday night tradition to create our own memories. Working for Starbucks I hardly ever have a Friday thats really a Friday. I’m usually up early Saturday morning working an unpredictable day, just dreaming of sleeping in on Sunday morning. This weekly tradition is a little excuse to still celebrate on Friday and I’ve been figuring out healthy alternatives for pizza along the way. I still haven’t attempted making pizza dough with the Vitamix and this bad baker still needs to get a rolling pin so in the meantime I decided that the Artisan Whole Grain pizza dough by Pillsbury was the safest bet. On this pizza I drizzled EVOO, herbes de Provence (of course), shredded pecorino, crumbed bacon, red onion, thinly sliced apples, spinach and french feta. The secret is a blazing hot 500+ degrees oven. The pizza baked perfectly in under 6 minutes! My new trend in the kitchen with pizza is to top it with fresh arugula after it comes out of the oven. The arugula just slightly wilts over the heat of the pizza and it adds this sweet peppery flavor and fresh texture. The second pizza was topped with a gourmet Italian pizza sauce from the cheese shop down the street (I cheated!). I added some fresh Burrata from California. It’s a fresh Italian cheese made with mozzarella and cream. The outside is a shell of solid mozzarella while the inside is a mixture of mozzarella and cream, giving it a uniquely creamy texture. Burrata melts beautifully on pizza! I finished the pizza with almost the same ingredients as the one before it; spinach, bacon, feta, etc. Topped it with arugula and…bon appetit! Now it seems like every Friday I’m trying new flavor combinations for Pizza Movie Night! Last week I substituted pesto as the sauce and completely covered the pizza with rows of juicy rotisserie chicken (cheated again! ), freshly sliced mozzarella and roma tomatoes. After the oven I topped it with arugula of course! That was my favorite version of Pizza Movie Night, yet! My husband makes fun of me because any time we have something with eggs I say something like “I would rather have eggs than (insert choice protein here) any day!”. I think I like the fact that it’s nutritious, delicious, versatile and I don’t have to worry about weird pieces of cartilage, veins and fat like I do with poultry or beef. I was just out in LA with the Filipino side of my family and I had Chicken Adobo with hard boiled eggs in the broth over rice. Oh my, it was incredible! I can’t eat anything off of the bone so I appreciated that I had some good quality protein to eat with such an amazing sauce. Prior to my trip out to LA, I had decided that I wanted to make some protein-packed snacks to take to work during the week. Before I learned this, my idea of a hard boiled egg was probably bright pink on Easter with a day-old gray-blue center. Gross. Since then I’ve learned how to get a creamy, golden yellow yolk for the perfect high-protein snack! You’ll start with at least 6 eggs. Leave them at room temperature for around 30 minutes. Boil a pot of water. Once the water is boiling you’ll gently ladle them into the water with a collapsable silicon measuring cup or whatever is available. Just be careful to gently lay the egg at the bottom of the pan during this process and to not crack it. The magic number is 10. While the eggs are cooking you’re prepare an ice bath: giant bowl filled with ice and water. When the eggs are done you’ll strain them and quickly transfer them into their ice bath. This stops the cooking process and allows for the eggs to be peeled easier. Once you’re ready you’ll pull your eggs out of the ice bath, peel them, slice them and scoop out the yolk with a spoon into a different bowl. Mix the yolk together with a large scoop of greek yogurt, tabasco sauce, celery seed and crushed black pepper. Transfer all of the yolks into a zip-loc bag, snip the tiniest bit off of the corner of the bag and pipe the yolk mixture into the whites of the eggs. You’ve just made the healthiest deviled eggs (should we call them “heavenly eggs”?). They’re perfect to pack for your lunch at work with 6g of protein and hardly any carbs. 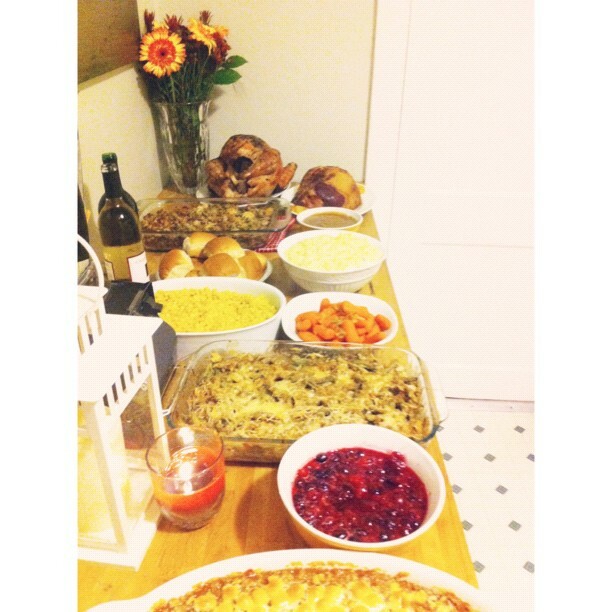 This was my first year ever hosting Thanksgiving! I was so excited to make all of this delicious food, have all of these people fill our little home and create new memories and traditions for our family. About a week before Thanksgiving I started researching blogs and recipes looking for great ideas that were gourmet and creative but still traditional. 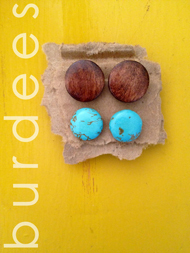 I wanted to have a menu planned that would be cohesive but still fun and adventurous to make. I started cooking on Tuesday. I decided on a pecan pie (my Mom’s favorite that she’d make every year) and a pumpkin pie. Lets just say I’m not a baker. I leave that for my best friend, Tara. This Thanksgiving the Trader Joe’s Pumpkin Cheesecake was a hit and the whipped cream that I tried to make from scratch with my Vitamix (that I overheated) was not. 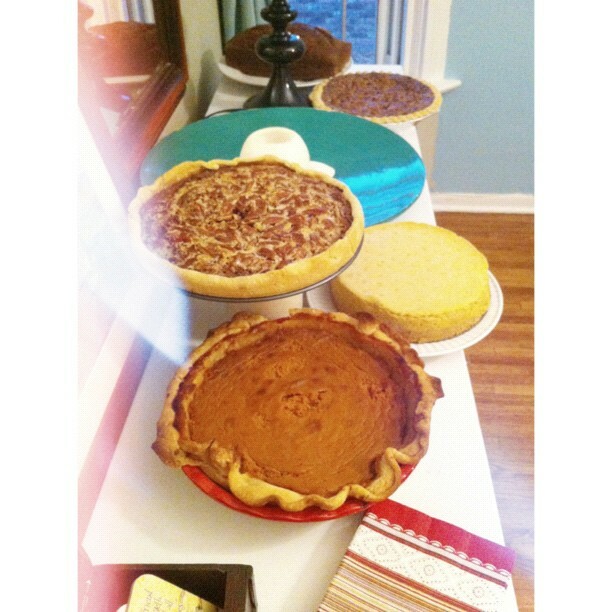 I did have fun making the pies though! This is my Christmas jam. 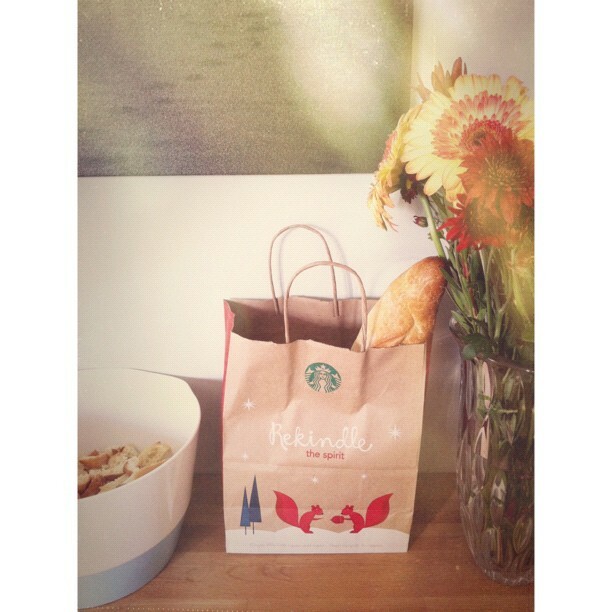 The best Christmas compilation Starbucks has put out in the longest time. 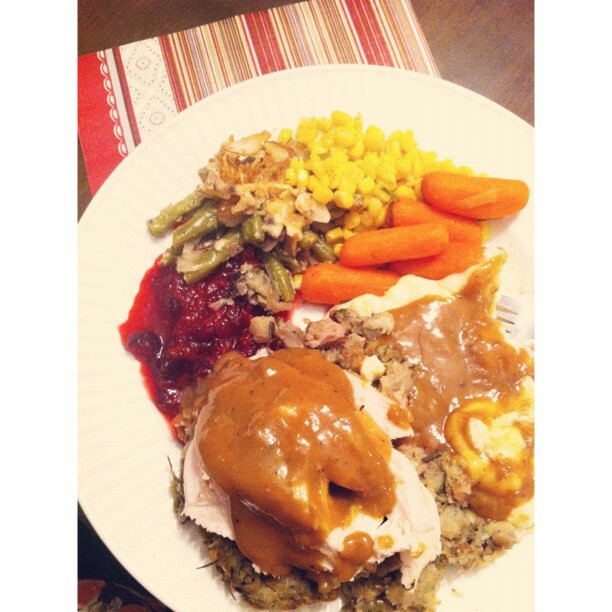 Now the Thanksgiving dinner, on the other hand, turned out absolutely delicious if I do say so! By the time we sat down to eat I was so exhausted from working and cooking all week. Making the dinner was such an event, such an experience, that I actually miss it. It was so rewarding to have a house full of people talking and laughing – that’s my favorite part. I just love Thanksgiving! 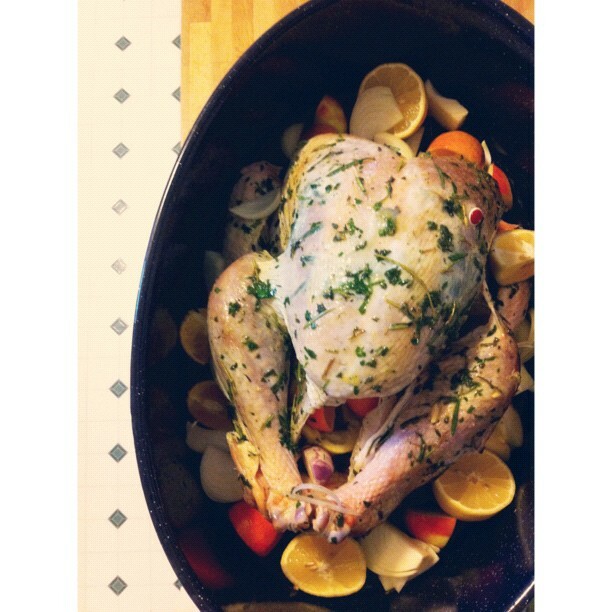 An Apple Shallot Turkey that I got a little creative with by adding freshly squeezed lemons and tangerines. We’ve had a lot of produce on-hand since we got our Vitamix so I wanted to make sure those didn’t go to waste and I thought the citrus would add a fresh touch. I did a lot of research before cooking my fresh turkey and actually diverted from the recipe and started it two days earlier. I had my neighbor come over and help me pull out the insides (no joke), rinsed it, dried it, (squealed a lot…so gross) and literally used a whole jar of sea salt to rub it down. What I learned is that adding all of that salt, you’d think it would make your turkey really salty but if you do it a couple of days ahead of time and leave your turkey uncovered in the fridge, you’ll find that it actually increases the “water retention” leading to a juicier, more flavorful bird. I had decided not to stuff the turkey with anything other than fruit and root vegetables. Apparently the juices from the fruit and the sweetness from the roasted root vegetables make the turkey sweet and juicy while allowing it to cook more evenly. 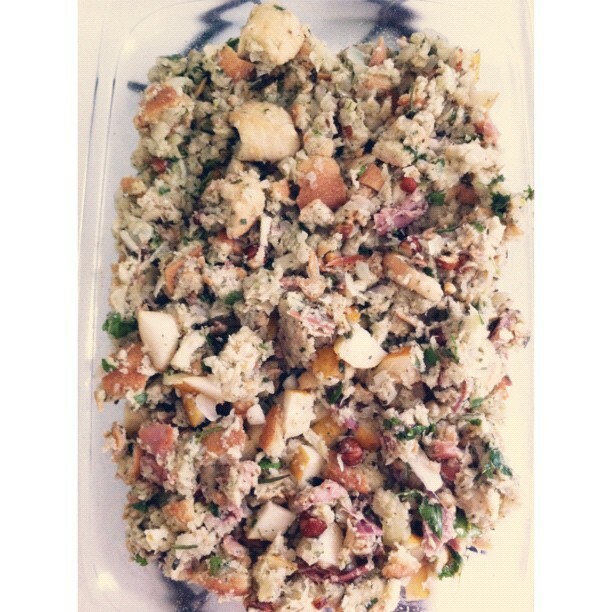 Instead, I made the stuffing (my favorite part) from scratch. 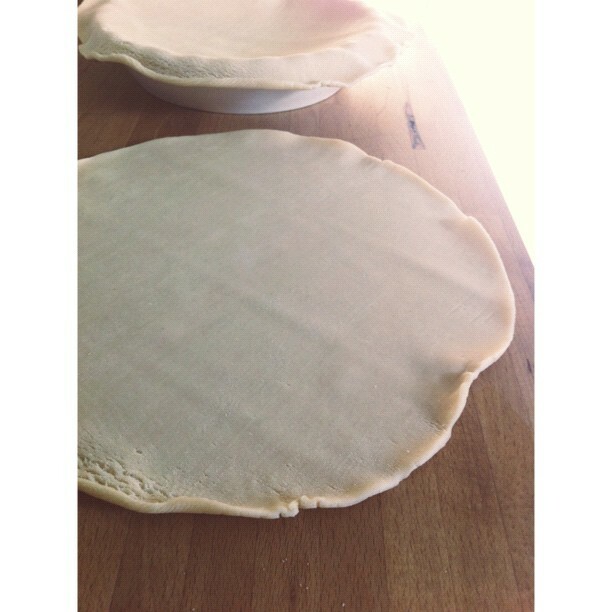 I decided on a recipe that added a creative twist to the traditional recipe. The fresh herbs and toasted hazelnuts made my kitchen smell amazing and it turned out really delicious but if I did it again I’d choose something other than prosciutto. I also made the cranberry sauce from scratch (my other favorite part). I made up my own recipe using fresh cranberries, orange juice, truvia, tangerine zest and my favorite Tennessee honey whiskey. As bad as they are for you I just couldn’t help but try out Martha Stewart’s Mom’s recipe for the mashed potatoes. I thought I could use the Vitamix to mash the potatoes but I should’ve let them cool first. Instead, the heat from the potatoes and the fast blades of the Vitamix caused the appliance to overheat and stop working completely…until it cooled off (thank God!). 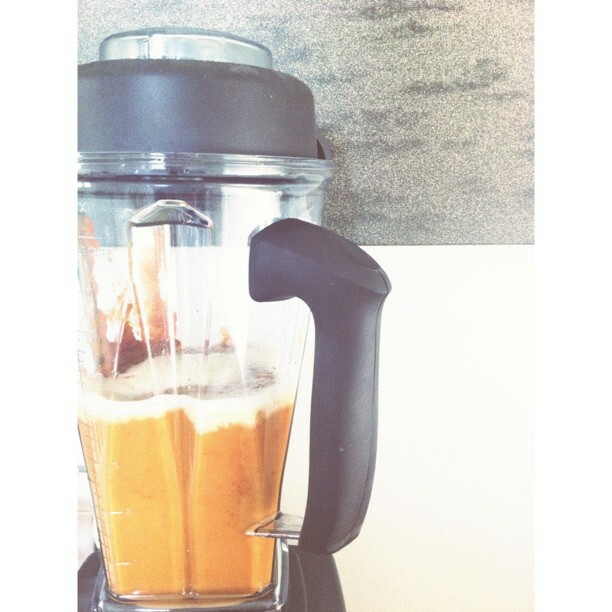 At the last minute I decided to make a side dish of buttered carrots and onions. I used a little nutmeg and cayenne pepper to spice up that quick and easy side dish. We had so much more food than what I listed (made by our amazing friends, none of which were Minnesota natives) but I just thought I would include the recipes I used for those of you that asked! 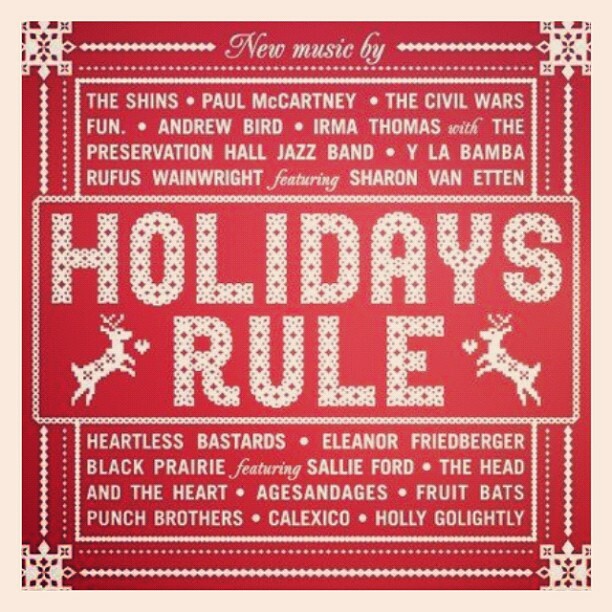 Also, if you already have “Holidays Rule” I highly recommend buying “A Very She & Him Christmas” by Zooey Deschanel and M. Ward. I woke up really excited yesterday morning because it was the day we were going over to our cousin’s to have dinner! My cousin, Bill, loves to grill and smoke meats so I knew it was going to be a great dinner. I was told to bring a salad so all day I was dreaming up something that would go well with grilled pork. I finally decided on a recipe I was really excited about, started making it and about an hour before dinner I found out that the pork was marinated in a citrus adobo sauce. Had I known, I would’ve picked a recipe that had more citrus complementary flavors. Still, it was a great pairing! The pork was literally the best I’ve ever had! He tenderizes the meat overnight in a citrus marinade that really breaks down the texture of the meat which means a perfectly juicy, perfectly cooked pork tenderloin. My salad was the most advanced and adventurous recipe I’ve made. It was actually a lot easier to make than it seemed with all of the complex ingredients and directions. I found the recipe at this website that will contribute to a lot of the recipes I’ll be making on Thanksgiving day! There is a Noodles & Co. right next to my store. After about nine months, I gave in and tried the Penne Rosa, highly recommended by my friends at Noodles. I’m not really a pasta person so up until then I was only ordering their Tomato Basil Bisque or their Caesar Salad, but I have to say, it was incredibly delicious! I liked it so much that I made my own alternative version a couple days later. This one has less pasta, more veggies and more heat. All around, I’d say that’s better! I sauteed a little bit of garlic and onions in a little EVOO and – get this – a splash of red wine. After the garlic starts to brown and the onions start to caramelize, I added a jar of spicy marinara sauce (easy!). You have to simmer this sauce on low or it gets a little…lava-like; bubbling and reminding you of the importance of a backsplash. I added lots of crushed red pepper to kick up the heat and then just a little bit of heavy whipping cream. Usually greek yogurt is my go-to for adding creaminess to dishes but I wasn’t sure how the consistency would hold up with the acidity of the tomatoes. I’ll have to try it the next time I make this. While the sauce was cooking I sauteed some shrimp in a little (very little!) bit of butter and garlic. Shrimp is my new favorite thing to incorporate into making quick dinners. It’s easy to just have a bag of frozen, peeled, tail-off, already-cooked shrimp. You saute for a couple minutes and you’re done! I had 100% whole grain penne pasta cooking while I was making the sauce. 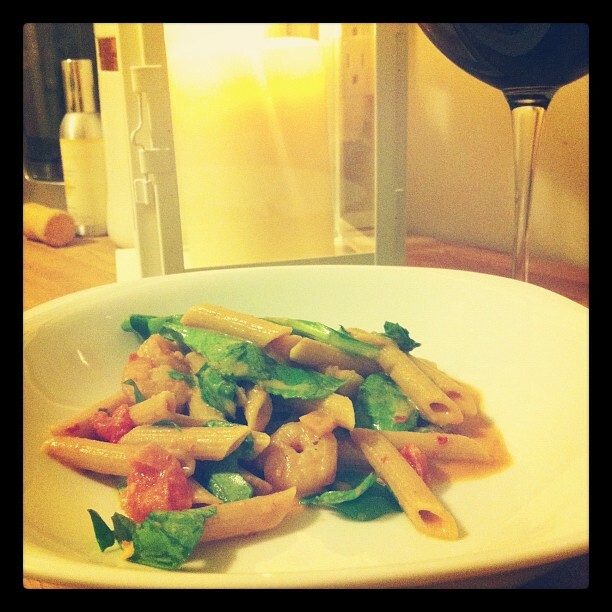 Two handfuls of penne: 10 minutes to al dente. Drain, rinse and incorporate into the sauce. Finish by stirring in tons of chopped spinach and mushrooms. Top with (my favorite!) french feta cheese. When my best friend’s sister, Steph and her husband, Adam, lived with my family, I learned that the secret to “fresh pasta” was to add raw veggies (like spinach, mushrooms, tomatoes, etc.) at the very end. It really enhances the slow-cooked sauce’s flavors and is a great alternative to pasta. More veggies and less pasta is always the way to go! The sauce was so delicious, I think next time I’ll kick out the penne and serve it just on a bed of raw spinach and mushrooms! There’s this cute little gourmet cheese shop just a mile from my house. They have the best selection of cheese in the twin cities, artisan sandwiches, gourmet entrees of the day for dinner to-go and an extensive selection of healthy salads and sides in their deli. It feels like you walked right into a New York deli. I’m mostly there to check out the two different gluten free soups that they offer daily. The chef is brilliant and comes up with some of the best soups that I’ve ever tasted: Watermelon Gazpacho, Coconut Corn, Chicken & Dill Mazo, just to name a few. 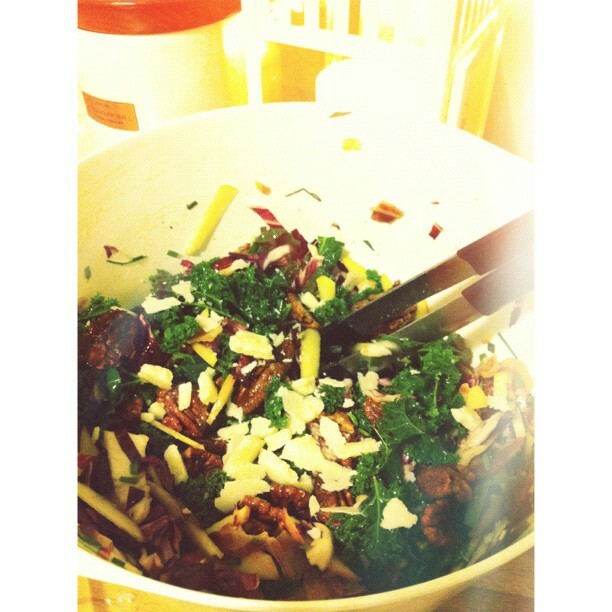 They also have this Kale & Feta salad that I can’t get enough of. It inspired me to create my own salad with a seasonal twist. First I took a giant bunch of kale, stripped all the leaves from the stalk, tore them into bite size pieces, and covered them with water in a big pot. 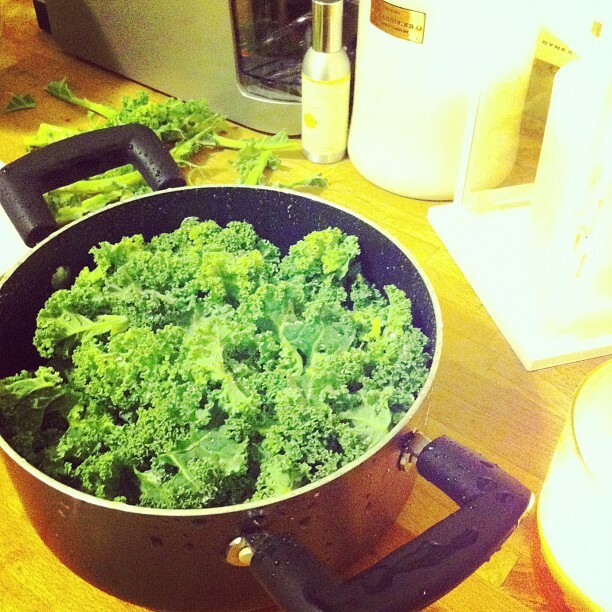 I boiled the kale for no more than three minutes – just enough to tenderize the leaves. If you’re making this recipe a day before you’ll actually eat it, you don’t need to boil the leaves because the apple cider vinegar you add will tenderize them naturally. Making it this way is actually the best way to retain all of the nutrition of the kale that you would otherwise lose in the boiling process. 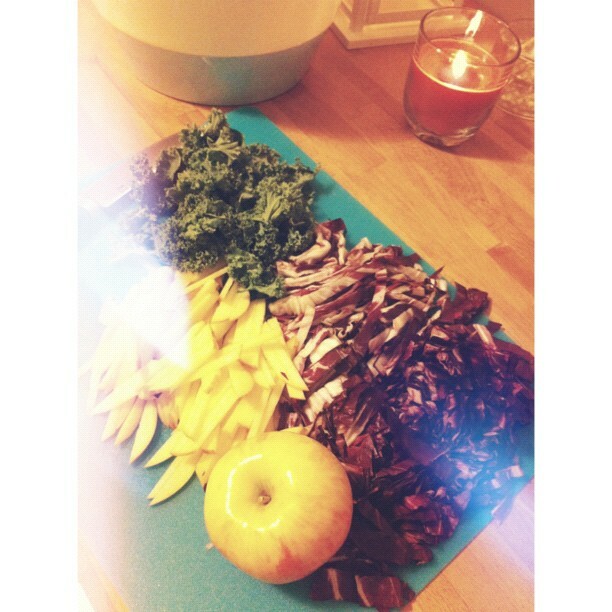 Drain, rinse the kale in cold water and throw in a large bowl. Toss the kale in a mixture of (best if it’s the organic with the “mother”) apple cider vinegar, EVOO, cayenne, and freshly ground pepper and sea salt. Then I mixed in some crumbled french feta from the cheese shop and the arils of a pomegranate. It was so delicious, cheap and easy. 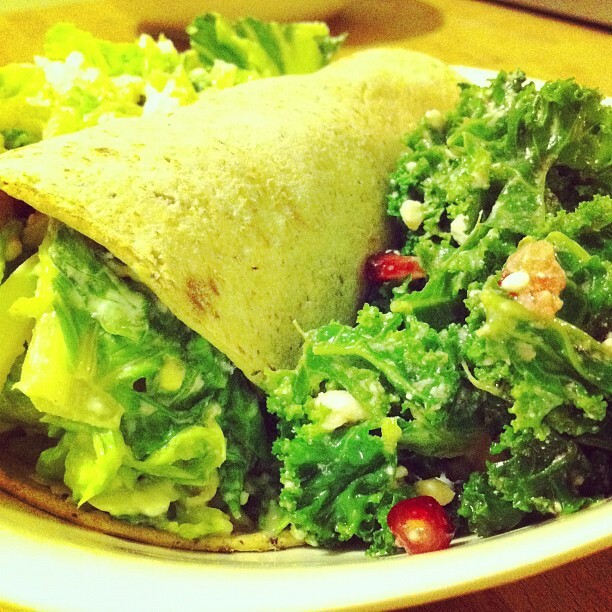 It’s my new favorite way to eat kale! I think I made White Chicken Chili almost every week since we’ve been home from Hawaii. It’s such an easy meal to make, it’s cheap, fast, healthy and easy to leave on the stove until Eric comes home from work. But this can’t go on forever. 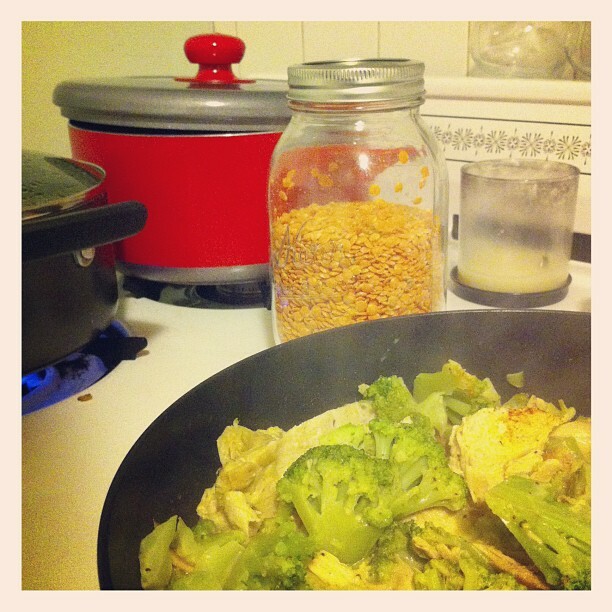 Instead, I tried to be resourceful with what I had in the kitchen and ended up with a new cheap, fast and healthy recipe! I started off with sauteing a little garlic in a little EVOO and a 1:1 ratio of chicken broth and almond milk heating up in the bottom of a skillet. I added sliced chicken breasts and slowly simmered. Then I added a little freshly ground pepper, sea salt, cayenne, and a spoonful of flour to thicken the broth/milk mixture into a sauce. The great thing about this dish is that you can incorporate any kind of vegetable you might have on-hand. I added a bag of frozen broccoli florets, covered and left to slowly simmer. 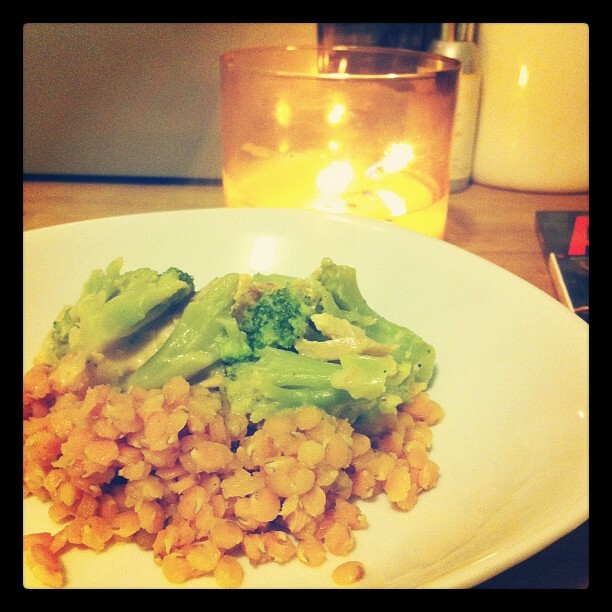 I’m rekindling my love and appreciation for lentils as a cheap and easy carb alternative. Red lentils are especially easy to cook like you would cook pasta; big pot of boiling water, ten minutes, strain, the end. Easy. This dish is just a basic format to the start of any kind of simmering chicken and veggies. You could kick up the heat with (my go-to ingredient) Sriracha, turn it into a curry by substituting the almond milk for coconut milk and adding curry powder, or you could get a little more gourmet and saute onions with the garlic and finish the dish with some freshly chopped thyme. The key to “inventing” recipes is to get a hold of a basic format for the execution and then to get creative with the different flavors and elements you’ll be incorporating. It’s like alternative cooking – take a traditional recipe, choose alternative healthy ingredients and then a complementary flavor profile. I went over to the guy’s house last night to make them dinner. I was trying to think of something low-carb & “manly” (which I’ve learned translates into “meat”). What I came up with was super fun and easy to make! It tasted good too! 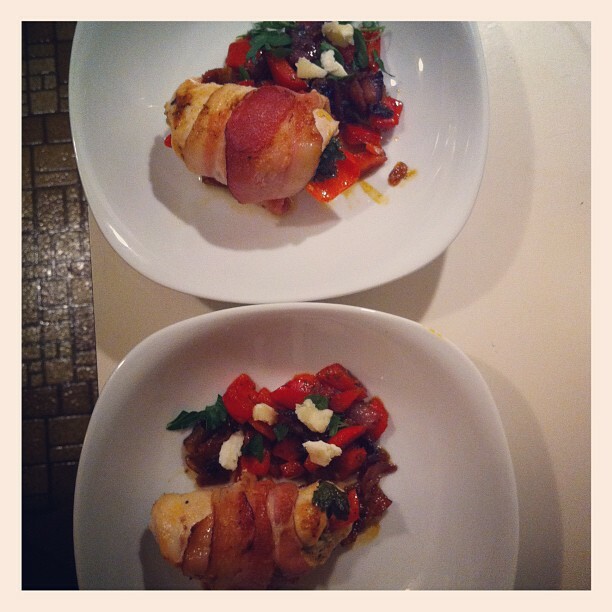 For the bacon-wrapped chicken I started off by slicing (lengthwise) two little red chili peppers. Next I chopped up a handful of Italian parsley and long thin slices of a Spanish goat cheese called Cana de Cabra. Any kind of goat cheese will work, I just had some from the cheese shop down the street that needed to make it’s way into one of my next recipes. Now that you’ve prepped your “stuffing”, you’ll take a few boneless, skinless, chicken breasts and cut in half (lengthwise) to make them thinner cuts of chicken. 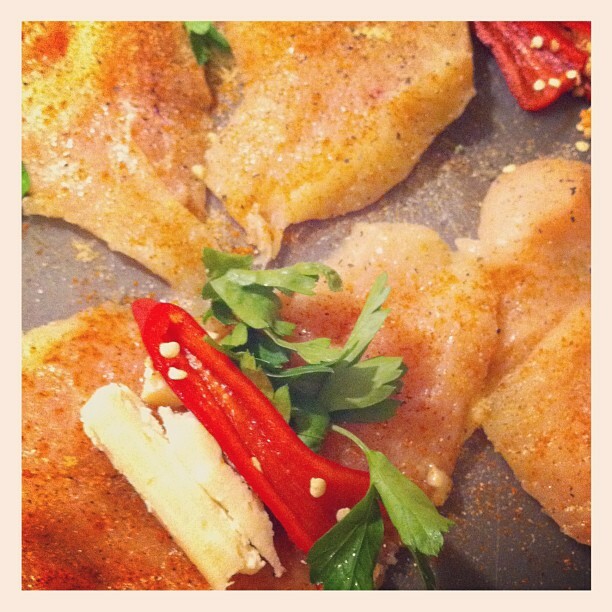 Lay all of your chicken breasts on a cutting board and sprinkle with some salt, pepper, and a little bit of cayenne. On each seasoned chicken breast you’ll add a pinch of your chopped parsley, a slice of chevre, and a slice of chili pepper. 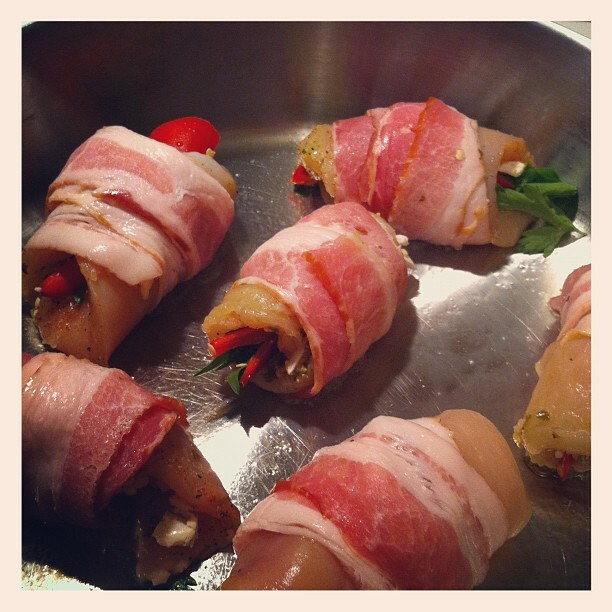 Now you’ll roll up your chicken breast and wrap it in two slices of bacon. I normally would’ve used turkey bacon but since I was going for a “manly” entree I decided to use center cut bacon. At least that cut has 35% less fat? 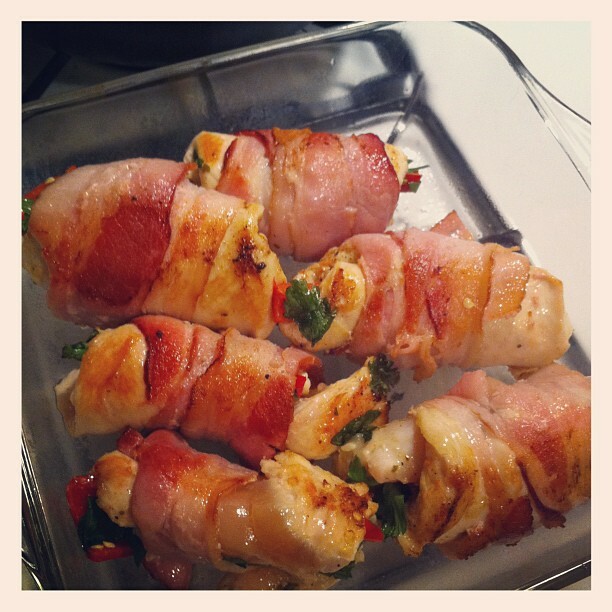 Over medium-high heat brown each side of the bacon-wrapped chicken for just a few minutes. This will give you that crispy bacon texture but still allow you to slow-cook your chicken without it drying out. Keep in mind that you don’t have to fully cook your bacon/chicken, that will come later. Once you have some nice brown coloring on your bacon, transfer your wrapped chicken to a baking dish. Bake your chicken, covered, at 350 for about 10-minutes. I get a little nervous about undercooked poultry/pork so I think I did mine closer to 15-20 minutes. With the temperature at 350 and a cover keeping all of the moisture in, you don’t have to worry that your chicken will burn or dry out. Unfortunately I had to use aluminum foil but maybe some day someone will give me a Le Creuset French Oven! Then I won’t have to worry about my food losing moisture during baking or my body being full of toxins from the aluminum used in the cooking process! For the red pepper side dish, I THOUGHT that I was just going to do vegetable with similar flavors to the chicken but I was surprised by the outcome. While the chicken was cooking I chopped up the rest of the bacon into little pieces and sauteed them with half of a chopped red onion until it caramelized in a little bit of honey, cayenne and a splash of red wine vinegar. Then I chopped up a red bell pepper and mixed it up in the pan, just heating it for about 90 seconds – I wanted to preserve as much of the freshness, color, and nutrients as possible while still incorporating it in the rest of the dish. It ended up being much sweeter than I expected but the chicken ended up being a lot spicier than I anticipated so it was a perfect pairing! I sprinkled a little bit of parsley and goat cheese on the vegetables, topped it with the chicken and “manly dinner” was served!